Please wait while we load filters for all of our rental equipment. We could not find any filters for the products on this page. No products found - please refine your filters. You wouldn’t try to twist a hex nut with a Phillips screwdriver, and you wouldn’t rip plywood with a chop saw. Don’t send scaffolding to do a manlift job. When your work space is a couple of stories off the ground, you need a stable work platform to get the job done both correctly and safely. You need an aerial lift of some kind. Is a manlift the right machine for you? Many specialized machines are designed to lift workers and their equipment up toward a work site. Boom lifts have great range and articulation, but they are too heavy and wide to get into tight spaces. Scissor lifts are narrower, but can only rise straight up. What if you need to get through a narrow entrance, work on a fragile floor, and reach 15 to 100 in the air? You need a manlift, also known as a man lift, personal lift, or personnel lift. Like boom lifts, manlifts feature telescoping and articulating arms that can reach up and around. Unlike boom lifts, manlifts do not contain heavy self-driving mechanisms. Smaller manlifts have no motor and must be pushed around. Tracks power larger units. If you need an affordable machine and only need to travel vertically, consider a belt manlift. A heavy boom lift will drive through places a powered manlift will not, but it can be a hazard to indoor flooring. If you are working inside a church, for instance, with a beautiful tile floor, the weight of your lift is critical. Don’t crack that floor. An 80′ diesel/dual fuel articulating boom lift weighs over 34,000 pounds. 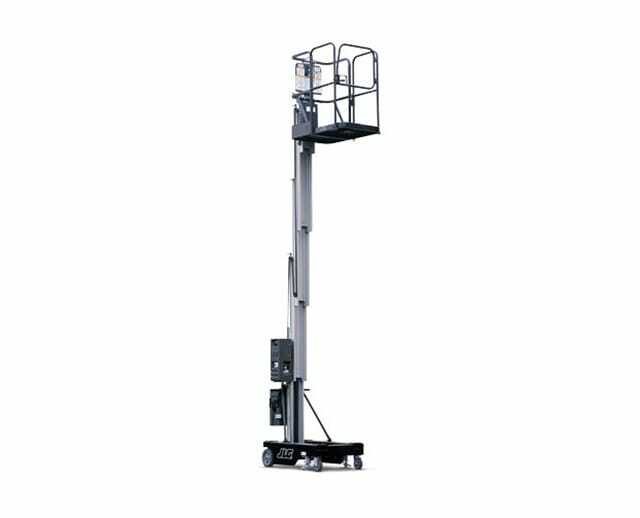 An 89′ atrium manlift has a slightly longer reach but weighs a dainty 10,000 pounds. 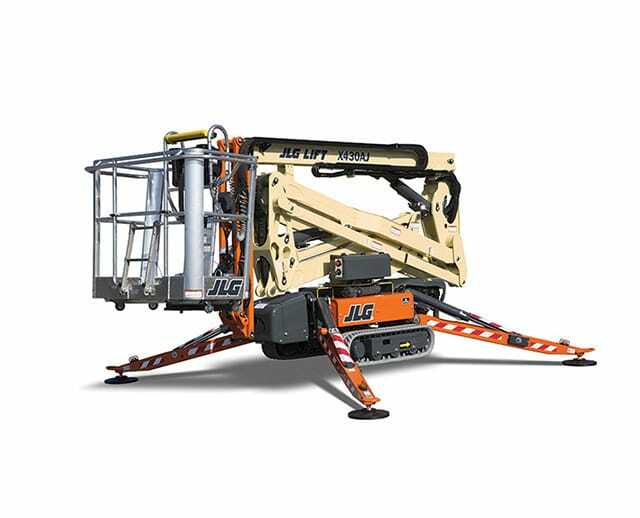 The manlift, at under six feet wide, will also slip through doorways the eight-foot wide boom lift will not. Will you be moving the lift over rough terrain? Do you need to be careful not to damage the floor? Are you working indoors or outside? Will you be moving through narrow spaces? How often will you be moving the aerial lift? How high do you need to reach? 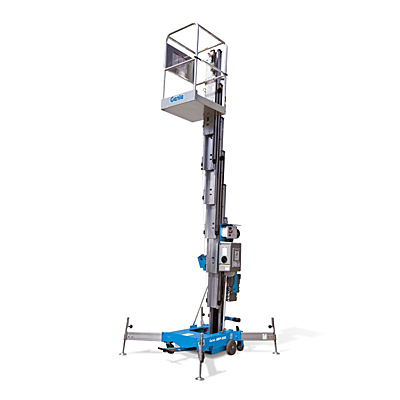 If you need to get through a single or double door and operate on a sensitive floor, and you won’t be in constant motion, then a manlift might be the machine for the job. Remember that new concrete takes up to 30 days to cure. Don’t park a 20-ton diesel boom lift on it. Any aerial lift carries risks of falling, tipping, electrocuting or crushing workers. Proper training and certification are required. Operators and supervisors must be aware of the unique dangers of operating a power lift. At the start of the workday, inspect the machine and all safety equipment. If something is not right, make it right. An advantage to renting rather than buying a lift is that you can trust that we take expert care of the equipment you are using. Before positioning the lift, check the environment. Test the ground quality, note all overhead hazards, and check the surrounding area. Read all of the manufacturer’s instructions and know the limits of the machine. How much weight can it hold? How much wind can it tolerate? If you are using your manlift indoors, you may not be thinking about the wind. Consider whether opening the doors at both ends of a large building will cause a sudden cross breeze. Think of everything, and you’ll have fewer surprises. Shut down all unnecessary electrical sources. An electrical arc can cover a surprisingly long distance. Treat every wire, line, and socket as if it was live. A manlift presents a different set of hazards than a boom lift or a scissor lift. Because manlifts are designed to be lightweight and narrow, proper deployment of the outriggers is critical. The manlift is inherently tippy. Use extra care when parking and moving the lift . The fastest way to lose money in business is not by missing a deadline, by being outbid, or by having unexpected costs. Rather, it’s by workplace injuries. They cost you in workers’ compensation, loss of production, delays in job completion, and in damage to your reputation. Do you want to be well known for consistent excellence and safety, or for being the contractor who had that giant accident? You could lose clients, workers, and your job. Employers pay out nearly $1 billion per week in workers' comp. You don’t have to be one of those employers. Take the time required to work safely. The bigger the machine, the greater the risk for more severe injuries. How can you minimize the chances of injuries while using a manlift? Train all operators and supervisors appropriately and consistently. Adhere to all of the manufacturer's guidelines while maintaining and operating the equipment. Do not override or disable any of the hydraulic, electrical, or mechanical safety devices on the lift. Never attempt to move the manlift when it is occupied. Never let workers get between the guard rails and joists, beams, or other overhead obstacles. If the basket moves, they could be crushed. Stay at least 10 feet from all electrical lines. Treat every wire, line, transformer, or socket like they are live. Use a restraining harness or belt at all times. Attach it to the platform, not the guard rail. Use wheel chocks, brakes, and outriggers properly. Double check them before allowing any worker into the basket. Add the weight of all equipment and tools to the weight of the workers, being sure not to exceed the limit for the machine. Have multiple sets of eyes alert for hazards and changing conditions. Allow plenty of time to do a job, so no one feels rushed. Haste can lead to mistakes. Take the time to consider the physics of aerial lift operation. Excessive weight at the end of a long lever may result in disaster. A small force at the end of the arm can become a massive force at the base of the lift, particularly with a lightweight manlift that is reliant on extended legs for stability. Patience, awareness, and diligence will always pay off in the long run. The worst thing that can happen is not being stuck with high labor costs or with an overdue deadline. It’s an accident that can damage an employee and your reputation. Just because you’re only renting a lift for days or hours, it doesn’t mean you don’t need training. Once you’ve rented the lift, how you use it is your responsibility. Take the necessary steps to train yourself and your people. Doing so is easier and cheaper than you may think. Genie offers Lift Pro Online Operator Training. Contact them online or call 855-251-0423. The training begins with online videos, tutorials, and quizzes. It concludes with a hands-on session at your local Genie dealer. OSHA also offers manlift certification. For as low as $79, you can find training for a broad range of industrial equipment. OSHA courses are 100 percent online. Besides, education is an investment in yourself and your workers. Once trained, your certified safety personnel can be trainers for the rest of your workforce. How do I rent a manlift? After considering the specifications of the lift you need, go to BigRentz.com. Browse our extensive inventory of equipment and process your lift rental online. For how long can I rent a manlift? We offer rentals from eight hours to 20 days. Consider renting multiple machines for the different needs of your job. You might get it all done cheaper and faster. Will a manlift work in emergency situations? Yes. Emergency personnel uses aerial platforms for a variety of rescue purposes. Can I use power tools on a manlift? Of course. Many lifts come with power outlets built-in. When selecting the right lift, consider the number of outlets and how much space you’ll need for equipment. Aerial work platforms come in a wide variety of sizes, articulations, and power sources to suit a broad range of jobs. Carefully consider your needs, environment, budget, and work requirements before choosing the right lift from BigRentz.com. Have questions about which lift to choose? Don’t hesitate to call us. With the right lift, the right training, and the right workers, you’ll be able to do amazing things. Your clients will wonder how you snuck through a narrow doorway and reached all the way up there to produce beautiful results.